The month of March is dedicated to St. Joseph and falls during the season of Lent represented by the liturgical color purple; a symbol of penance, mortification and the sorrow of a contrite heart. The feast days of the most solemn and Holy Week commence Mar. 25 with Palm Sunday followed by the Sacred Triduum of Holy Thursday (Mar. 29), Good Friday (Mar. 30) and Holy Saturday (Mar. 31). Easter Sunday (April 1) commences with the celebration of the Resurrection and continues throughout the month. The CWL presents Tenebrae with the gentlemen alumni of St. Michael’s Choir School led by Douglas Tranquada. Tenebrae is comprised by a series of readings and responsories representing a portion of the passion and suffering of Jesus Christ. The music is composed by the founder of the Choir School; Msgr. J.E. Ronan and often is the prelude to Holy Week. Parish Hall starting after the 4:30pm Mass. 7 pm at Leisure Lanes at 728 Champlain Ave. Contact: Kevin Foxton at kevin.foxton.ca or (416) 556-0669 Come join your brother Knights for a fun night of bowling. All are welcome to join us in our traditional assembly. All brothers are encouraged to attend to build fraternity and engage collaboratively on the planning and execution of the council’s goals and objectives. Come help us build our Mission and Vision. Steve Ball at stephenlball22@gmail.com We have our Annual weekend sale of the K of C Annual Charities Raffle Tickets at the Pickering Mall. This is an important fundraiser for ON State Charities: Special Olympics, Arthritis Society and our council. Seating is limited so confirm your attendance at the anniversary lunch reception as soon as possible for this milestone event which is partly funded by our council. Contact Reid Robertson reidrobertson82@gmail.com Prize money for the winners & proceeds benefiting our charity for the evening. Tickets are $10 each or 3 for $25. Contact: Allan Ashby allanashby@rogers.com Join our brother Knights to help put on a talent showcase for the residents of the retirement community and the public. Contact: Jim Gauvin jgauvin@rogers.com Reminder to all Brothers to support this leading Council Charity fundraiser through signing up to golf, asking for sponsors or door prizes, getting involved. Ø 7:00 pm followed by Mass at 7:30pm. Contact: Paul Bertrand paul.bertrand@cpeoplemi.com During this Holy Season of Lent join our Church and Br. Knights in this special prayer led by the Knights. Ø St. Brother Andre High School, 6160 16th Avenue, Markham. Ø Volunteers needed to arrive at 8:00am Come and help support our Youth in Sports at the Regional Championship. For Boys & Girls; Ages 10-13. Ø Parish Hall starting after the 4:30pm Mass. Contact: Paul Bertrand paul.bertrand@cpeoplemi.com Please join our brother Knights for a silent retreat filled with prayer. Contact: Dan O’Leary dan.oleary@rci.rogers.com (416 564 5088) or Frank Straney charlenestraney@hotmail.com (905 839 6584) Come and have a great time with your fellow Brothers, spouses and friends at the popular St. Patrick’s Day Dance. Please bring your money for tickets and any door prizes to the Gen. Meeting on March 6th. “We wish all our Brothers and their families the best in 2018 as we enter this new year. We have many interesting events and activities planned for the balance of our council year that you can choose to be engaged with. With the Solemnity of the Baptism of our Lord now past, we commence the church’s month of February. This month is dedicated to the Holy Family with the Feast of the Presentation on Feb. 2nd. where the Christ child is ‘the light of revelation to the Gentiles will save his people from their sins’. The latter part of the month will be the beginning of Lent. We would also like to extend congratulations to our Council Director Kevin Foxton and his wife on the birth of their daughter this month. Parish Hall starting after Mass. Contacts Claude Rochefort at claudrit@rogers.com Come and help support our Youth in Sports at the Council Free Throw District Finals. For Boys & Girls; Ages 10-13. (Rosary or Mass at 7pm in Chapel All are welcome to join us in our traditional assembly. All brothers are encouraged to attend to build fraternity and engage collaboratively on the planning and execution of the council’s goals and objectives. Come help us build our Mission and Vision. Contact Kevin Foxton at kevin.foxton.ca or (416) 556-0669 Come and enjoy a great night of hockey and fraternity with our brother Knights. Dec. General Meeting and POT LUCK! General Meeting and POT LUCK! We wanted to take this opportunity to remind all of our brothers of our General Meeting this coming Tuesday, December 5th at 7:30pm in the Parish Hall of St. Isaac Jogues. As we approach this special time of year for us to celebrate the birth of our Lord, we would like to celebrate the season with a pot luck! Please bring a prepared dish that you would like to share with your fellow brothers to the general meeting. This will be a great opportunity to get updated on the upcoming events of our council and also to socialize with each other. As a reminder, please also bring in any men’s toiletries that you would like to donate. Brother Dan O’Leary will be delivering all donated toiletries to the St. Vincent’s Kitchen in Oshawa to help those in need. Also at the general meeting, we will be selling Christmas cards. Prices for a box of cards range from $4.50/box to $12.50/box. We are looking for brothers to help with and attend a few of our upcoming events. Light up for Christ – Wednesday December 6th. Mass will be held at 7pm with the lighting of our crèche and tree following immediately after the mass. Thanks for the generosity of your Council to donate the funds assisting the victims of the Wildfire in the Diocese of Kamloops area. The funds can be payable to ‘Knights of Columbus (BC) Charity Foundation’. 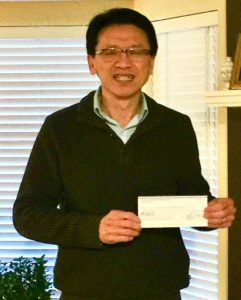 The cheque can be sent to our Foundation Administrator, Brother Michael Yeo, PSD. On the behalf of the Knights of Columbus BC & Yukon State Council, please send my best regards to the members of St. Isaac Jogues Council 11098. Apologies for the second email. We have made a few corrections from the previous email. We are coming up to a busy time of our council year. Please get engaged in at least 1 or 2 of these activities. There are many to choose from through to December so there is some flexibility in being able to do what meets your schedule. The more Knights involved the better for everyone. Pasta Bingo Night is Back! Parish Hall starting after Mass. All welcome to join us in our traditional assembly. All brothers are encouraged to attend to build fraternity and engage collaboratively on the planning and execution of the council’s goals and objectives. Come help us build our Mission and Vision. Join our 4th Degree Honour Guard and pay tribute to all war veterans and fallen comrades during the Remembrance Day parade, KofC 11098 will lay wreaths for our Council. Please join your brothers, remember and pray for our deceased fellow brothers of our Council. All are encouraged to attend with reception in Hall afterwards. St. Michael’s Choir School provides sacred music of the highest calibre to St. Michael’s Cathedral and the Toronto region. The choir has maintained a high standard of music performance. Its goal is to serve God, the Universal Church, and community with joy through sacred music. Meet at Church Back Lot 7:30 am or on Dixie Rd. by 9:30 am. Join your Brothers from St. Isaac’s & Holy Redeemer Councils with our popular annual Nativity float entry in this year’s parade to ‘Keep Christ in Christmas’. The parade starts on Dixie then E. on Glenanna to the Mall. Per Allan’s memo, Thanks to Br Blair for the tracking of activities by our Brs. over the last 2 years. With this & other information, I have attached an up-dated Retention list with the added columns that reflect this activity and engagement in our council. This is namely Paid Status (2017), Service Pillar Involvement, Event lead as well Council exec positions. What is noteworthy is that there are many paying Brs. who haven’t been active or in a fairly limited way. These would be our TARGETS to be more active, engaged and retain them as Brs. Again the trend is if they are not engaged over time then may leave. We had a good Business meeting with the Budget finalized and other items as Hockey, approved & recommendation on other items as increasing McCluskey fund. Bingo is ready to go and we do have some actions / projects our council will lead at Manresa post Reid & I visit there. I will report on that separately. We also agreed we need to refresh / enhance our church foyer bulletin board. I am not at the GM General Meeting Tuesday as I need to attend another. Tiago will be acting GK and Jason DGK. Besides the above , we will be moving forward with initial planning for the 25th with advisory input & presence of our PGK’.s, Jason and a few others. Inside and Outside Guards – Douglas Francis: A and E ; Mark Jakubiec: A and E. There is a need to fill 2 or more positions in the June’s general meeting in this group. Welcome again to the new 2017-18 Knights of Columbus fraternal year. This past month our council Knights have started this year with activities that attest to our fraternal spirit and what the Knights do for our brother Knights and the community. In August we supported the Youth Frisbee tourney with our BBQ serving over 200 participants. Earlier this month we had our best turnout for Council Fun Bowling and most recently our Brothers built a backyard staircase for the widow of a dear Br. who had passed. You can review these activities on our St. Isaac Jogues Knights of Columbus Facebook https://www.facebook.com/St-Isaac-Jogues-Knights-of-Columbus-1937011353221830/ and our web site. http://kofc11098.org/ Please ‘Like’ and ‘Share’ the activity page events that promotes our council’s visibility and actions that support our target causes and charities. chris@cjcarrandassociates.com Please come out and join the Lifechain to honour the lives of millions of babies who have lost their life to abortion. After all masses on October 1st. chris@cjcarrandassociates.com 416-561-5090 All proceeds to be donated to the Rose of Durham, Young parents support services. Please RSVP to paul.bertrand@cpeoplemi.com Religious freedom is important. Knights should see this film. The Mexican govt. persecuted the Catholic Church in the 1920s including priests. The Mexican Knights were instrumental in founding the League of the Defense of Religious Liberty to organize protests against persecution. kevin@foxton.ca Come out and enjoy an evening of Bowling with your fellow Brothers. On Monday, September 11th, we had our best turnout yet to bowling, 6 brothers came out. Please see the facebook page for pictures of the night! Please try to come out next time if you missed it! Below is a timelaps of the second of the two games played!